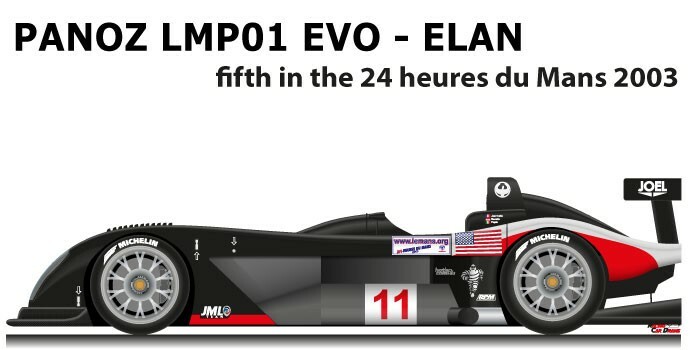 The Panoz LMP01 Evo – Elan n.11 is a prototype that participated in the 24 Hours of Le Mans in 2003. In 2002 the American manufacturer replaced the LMP07, with the LMP01 maintaining the characteristic of the front engine but with a substantial increase in the displacement to 5983 cc. In 2003 Panoz entrusted the management of the cars to the JML Team. Gunnar Jeannette, Max Papis and Olivier Beretta with the Panoz LMP01 Evo – Elan n.11 arrived fifth at the 24 Hours of Le Mans in 2003. The car started from the tenth position on the grid and despite showing a good race pace finished the race in fifth position with a gap of seventeen laps from the Bentley EXP Speed 8 n.7 of Capello, Kristensen and Smith. At the end of the season the team closed third in the constructors in the 2003 American Le Mans Series. Posted in DRAWS 24 HOURS OF LE MANS.